After you set up a class in Google Classroom, you will want to invite your students to the class. You can invite as many students as you wish. You can either invite students from inside your class, or you can give students a code with which they can log in to your class (which is certainly the easier way to go!). Log in to your class and click the Students tab. In the Select Students to Invite dialogue box, check the boxes next to all of the students you wish to invite to the class (see Figure 1). 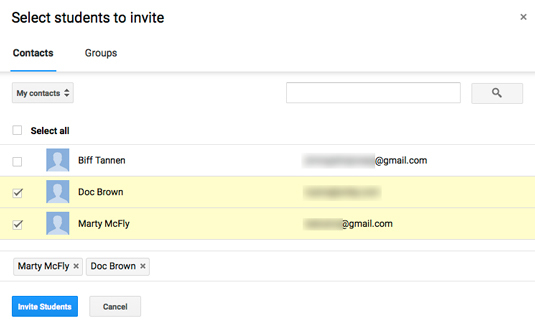 Your class list updates to include the students you just invited. The invited students receive an e-mail asking them to join the class. Each student has to click the link in the e-mail to join the class. The students must have an e-mail address belonging to the school’s domain, such as myname@myuniversity.edu. You can’t invite people outside your school’s domain. If you have a large number of students to choose from, use the Search field at the top to find the students in your class. Figure 1: Invite students to your class. No Biff, please. 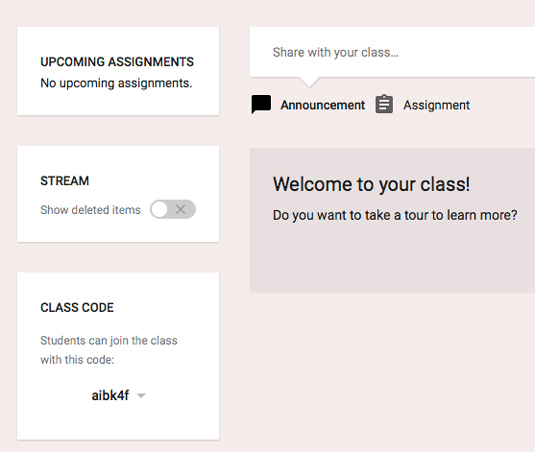 Log in to your class and get the class code on the bottom left (see Figure 2). Give that code to your students via the most convenient method (such as writing it on your classroom board or including it on a handout). Tell your students to go to classroom.google.com, click the plus sign at the top, and type in the code to join the class. If, for some reason, you need to disable or reset the access code, go to the Stream tab of your class and click the drop-down menu next to the access code. Reset assigns a new code to the class, disabling the old code. Students have to rejoin the class with the new code. Disable makes it so students can no longer access the class with that code. Figure 2: Find your class’s access code.